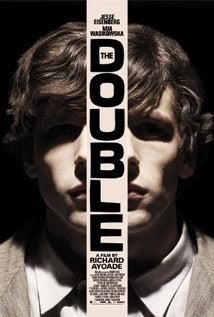 Movie Review: After become noticeable in 2010 with “Submarine”, helmer Richard Ayoade directs “The Double”, an offbeat dramedy with surreal traces based on Dostoyevsky’s novella of the same name, and starring Jesse Eisenberg and Mia Wasikowska. Simon James works in the same company for seven years, being responsible for several improvements in the field of regression analysis, a fact completely ignored by his uncaring boss. The shy, undecided, and often absent in mind, Simon, dreams with his co-worker and neighbor Hannah, following her with his eyes everywhere she goes – an obsession that takes voyeuristic proportions. Certain day, he finds out that a man, who physically looks exactly like him, is working in the company and occupies a relevant position. Becoming pals, the two duplicates will eventually clash when it comes to Hannah, the object of their fervent dispute. The eerie occurrences, oppressive dark settings, and weird characters present at the work premises are extensible to Simon’s home where his estranged mother whispers with a mysterious palm reader, saying her son is a strange person. Our senses are stimulated thanks to Eric Wilson’s compelling cinematography and Ayoade’s ‘off-the-hook’ direction, however the film doesn’t get close to the book that served as inspirational source. “The Double” belongs to those uncanny nightmares where everything can happen, ending ironically with Simon saying ‘I’d like to think I’m pretty unique’.